This is for that time of year when you’re confused. Whether you use a typical hard cider, or Harpoon’s Pumpkin Cider like I did–this is that time of year in a bowl. Or a mug, whatevs. Bursting with summer freshness yet crisp with fall. While I tend to stay away from most ciders on the market because I find them cloyingly sweet, I really enjoyed this Pumpkin Cider because of the lower sugar content. 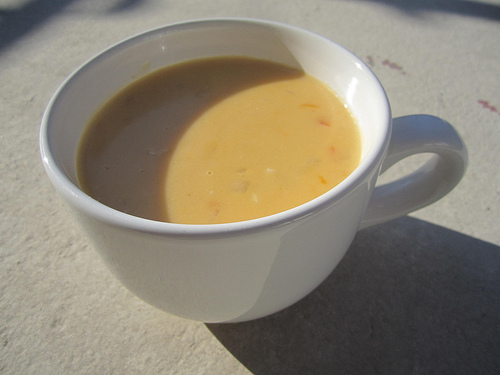 Magner’s would also be a good choice for your confused summer fall soup. Heat a soup pot over medium heat with the butter and olive oil. 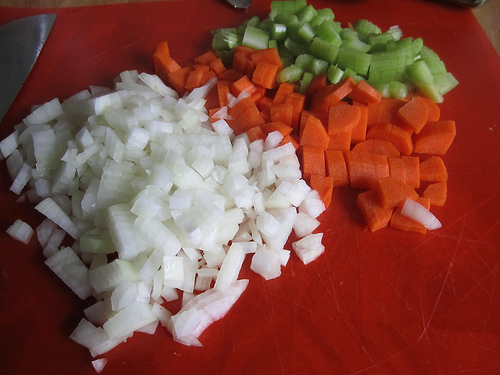 Saute chopped onion and carrots until softened, 6-8 minutes and season them with salt and pepper. Add garlic cloves and saute an additional minute. Stir in tomatoes, tomato paste, the bay leaf and basil. Bring to a boil, reduce heat, then stir in stock and cider. Simmer 30 minutes and adjust seasonings. Puree with an immersion blender or in batches in a counter blender or food processor. Garnish with additional basil leaves. 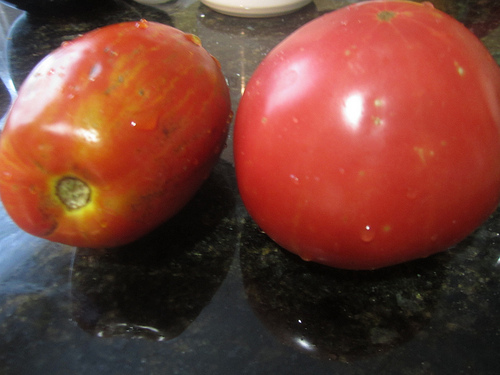 I have been receiving the most beautiful heirloom tomatoes in my CSA this late summer: red, green, yellow, orange, and some so deep they’re almost purple. Last weekend I literally thrived off of tomato basil sandwiches. So ridiculously simple and sooo delicious. I have to savor it while it lasts! I never had gazpacho until recently. (Cold soup? That’s an oxymoron!) 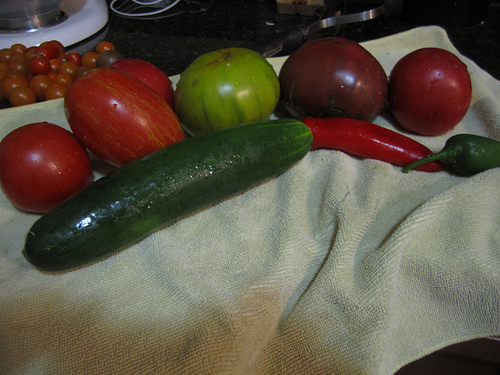 But I have to say, with the right tomatoes, and other seasonal freshness, I could definitely become a fan. 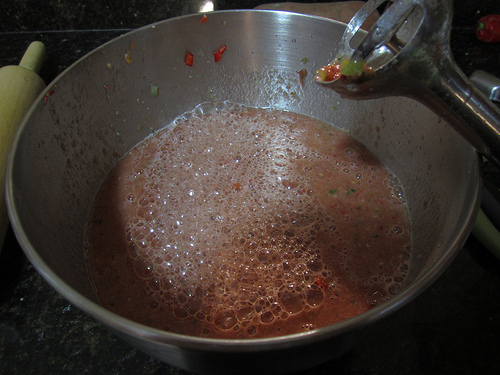 But even when enjoying some fresh gazpacho, I knew it could be improved–with vodka! 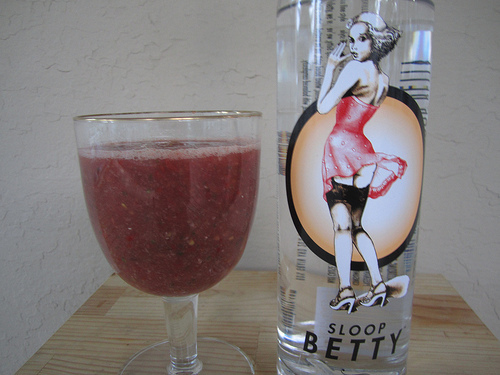 I used Sloop Betty, a wheat vodka distilled right here in Maryland. Once Betty was added, it was my kind of gazpacho. 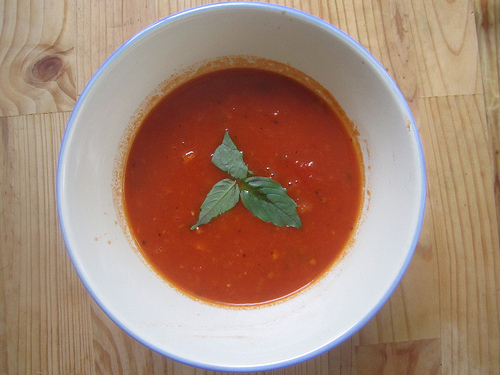 Gazpacho is also a highly flexible dish according to your own personal tastes. Some people want it chunky, some want it smooth, some want it spicy, others are weird. 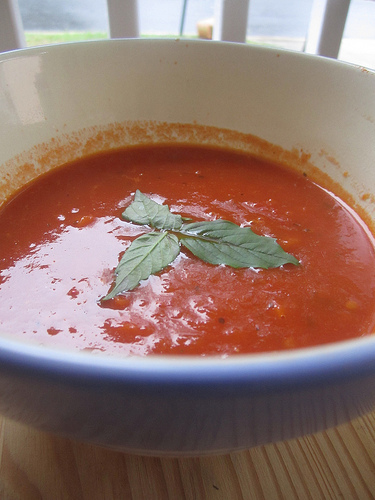 The amount of tomatoes you use may depend on how fresh and juicy they are, so be adaptable. Some people want a little vodka, others want a lot. But definitely use vodka, because-seriously. Why wouldn’t you? Cut vegetables into smaller chunks, toss everything into a bowl and take your handy immersion blender and go at it. Alternately, you can use a food processor or regular blender and blend in two batches. 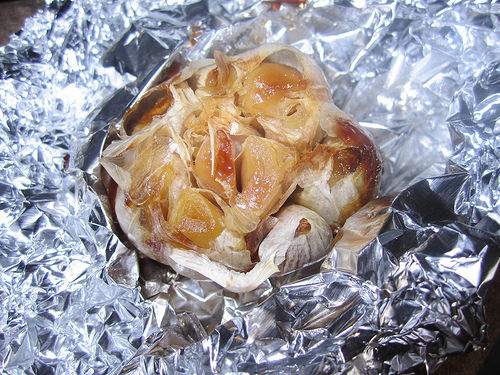 Cover and refrigerate overnight for the best results so that the flavors have time to meld together. Add vodka to taste when ready to serve. 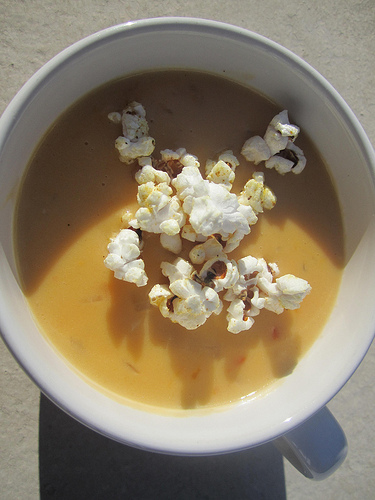 Beer Cheese Soup made with DC Brau’s Corruption IPA. Cause I don’t mess around. We live within walking distance of a brewery. And driving or biking distance of another (one of my most favorite places!). This is both a glorious, and a very dangerous thing. 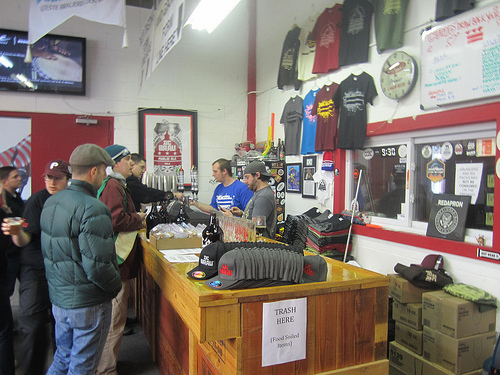 They have not yet been open for a year, and we have already spent more than our fair share of time at their growler hours on Saturdays. Perhaps way more. But it’s all good-we’re just supporting local business! Although I like the Public Pale Ale, the Penn Quarter Porter is delicious, and I’m really enjoying the limited release of Thyme After Thyme, I immediately fell in LOVE with the Corruption IPA. Being a lover of all things hoppy, it was pretty much made for me. 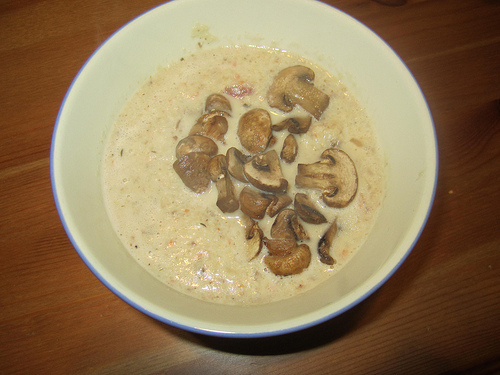 And me being who I am, for months now I have wanted to make a good beer cheese soup using DC Brau’s Corruption. And here it is. Hoppy, cheesy goodness. Not for the faint of hop heart. Chop the carrots, celery, and onion and saute over medium heat until completely cooked and soft. While sauteing, season it up with salt and pepper. Mince the garlic, add to the other vegetables and saute a minute at most. Add the flour and stir to coat all of the vegetables. Cook for 2-3 minutes. Add the broth, slowly at first, whisking the entire time. Pour in the beer and milk. 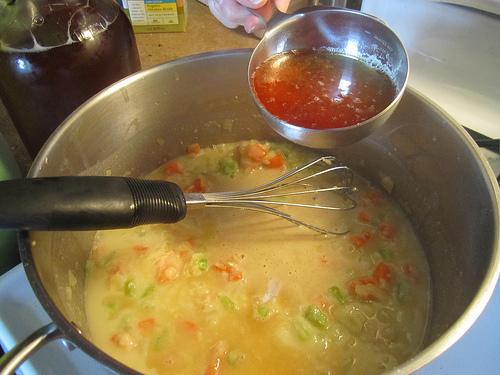 Let the mixture simmer for about ten minutes, whisking/stirring occasionally as needed. Turn the heat down to low. Fish out the bay leaves. Add the worchestershire sauce and mustard. Add the cheese one cup at a time, stirring and melting the cheese entirely before adding any more. Check for seasoning. Garnish with spicy popcorn like I did, or croutons, bacon, or whatever you’d like! 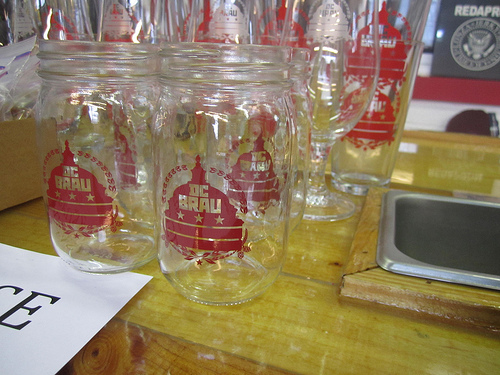 *I used two full cups because I had a growler full of beer. If you’re making this soup from a bottle or canned beer, that 12 oz. is plenty. Also, this soup can easily be made with almost any style of beer: pale ales, lagers, stouts, seasonals-whatever flavor you want to impart. If you don’t groove on IPA’s, it’s all good. I just love me some hops.